The past three years Elias Lanz has worked with polyester fleece boards to make furniture applications for Vitra. In designing for this thesis, he wanted to build on his experience and go beyond what he has done in the past. His aim is to make standalone products out of polyester fleece. Agility is an essential characteristic for companies to stay competitive. The flexible office makes physical movements and the expression of ideas quick and easy – it is agile. Folding designs out of polyester fleece sheets provide a furniture solution that reflect this agility. 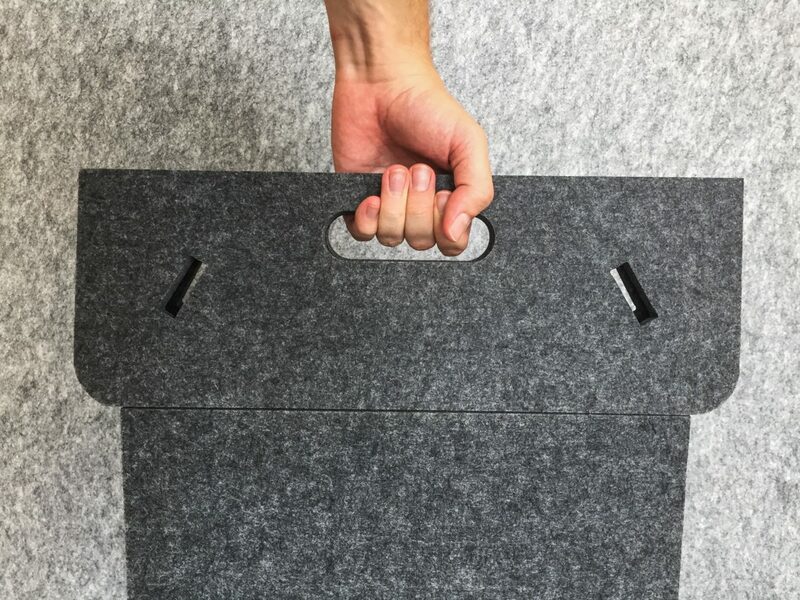 The fleece is rigid enough for furniture applications and can be folded when scored. 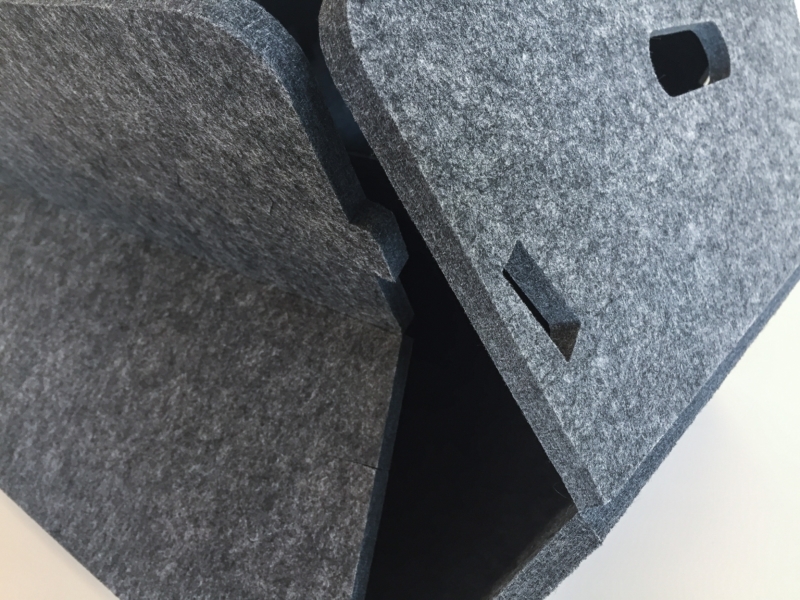 This thesis demonstrates the potential of foldable designs in the flexible office in three polyester fleece products. 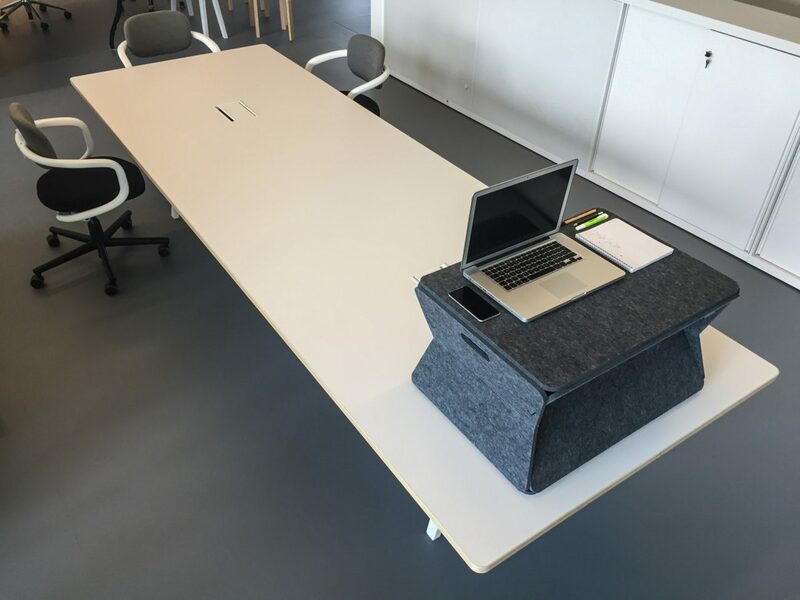 Foldable designs can be especially empowering to innovative knowledge workers in a start-up setting by enabling them to alter the workplace according to their needs. "My experience in folded designs and fascination with their possibilities spurred me to make this the topic of my thesis. It is uncanny what can be constructed out of a flat sheet of material with only cuts and folds. The art of origami is the biggest testament to this. However, scaling a paper concept model to create a durable foldable product presents a technical challenge that is far from trivial." Polyester fleece boards are a development that provide new possibilities in creating folding products. They are rigid enough to support weight yet can function as a hinge when stored. Among the potential applications for folding designs, furniture and furniture accessories are particularly promising. 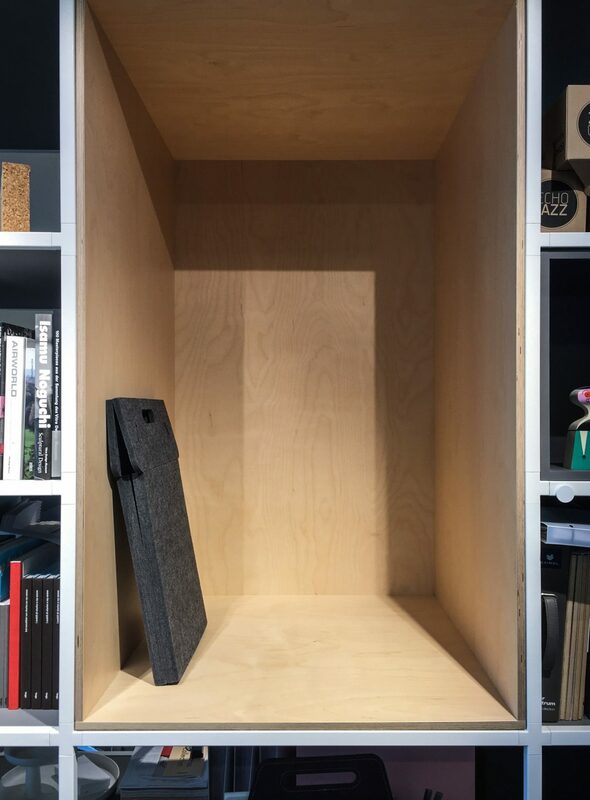 Physically, furniture provides a space for us and the things we use and store. Geometrically, it affords this with flat surfaces, volumes, and curves. Folding is great at creating these three-dimensional forms. Therefore, this thesis will pursue the application of folding designs to furniture and furniture accessories, more specifically, folding designs for the flexible office environment. This working environment can best benefit from the on-demand nature of folding products. The flexible office is a modern office concept that places high value on the adaptability of the office space. The goal is to eliminate friction and speed up workflows. Rigid work environments slow a team in moving from creative idea to execution. I"n working on special solutions for office needs at Vitra, I have gotten to know working environments and their needs. My office at home, where I developed most of the ideas for this thesis project, is highly flexible. The small room contains a sitting desk, a standing desk on wheels, a large whiteboard, two storage cabinets, a couch, and three printers. The availability of tools and different work environments is conducive to my creative work. This reflects my knowledge of and experience with the flexile office and working environments in general." The key to designing for the flexible office is to design for adaptability and availability. The design has to reflect the work and culture of the people in the office. Innovative teams with a startup ethos value speed over perfection. Office tools should not be cumbersome. An office is more than the sum of its parts. A random assortment of flexible furniture does not make a flexible office. It is important to look beyond the design of the individual furniture piece to make the office empowering to its users. The insights in this section reflect Elias' understanding of the design implications of the flexible office. Flexibility through adaptability is about the physical space of the office. It regards the adaptation of everything from workplaces, to storage units, to seating areas. This refers more to the office space as a whole than the individual piece of furniture. However, for the whole to be adaptable, the part needs to be designed for adaptability. Designing for adaptability means making things movable. This means putting things on wheels or making them light enough to carry. It can also mean making things stackable or collapsible for compact storage when not in use. 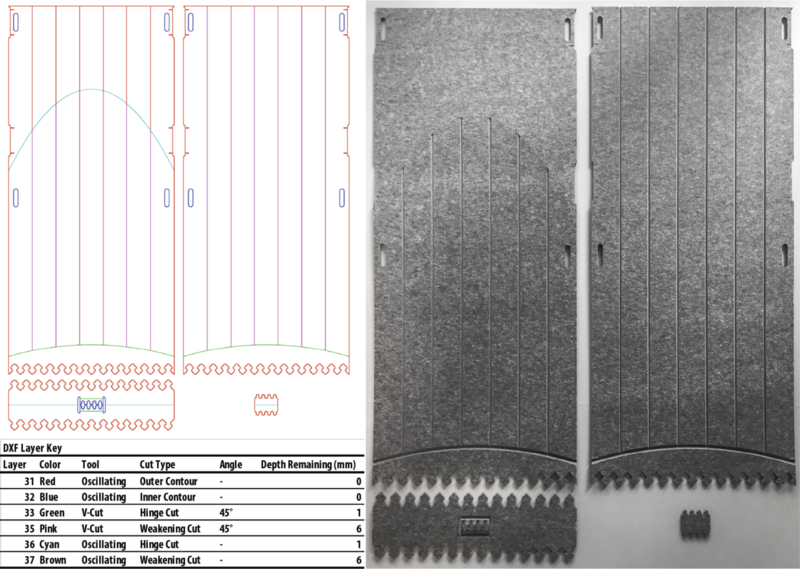 A further aspect of designing for adaptability is making items independent. It is common for office furniture to combine different uses in one object. This may be an elegant solution for serving two needs at once but means these two needs cannot be met independently. In the flexible office, everything needs to be readily available. Where adaptability focuses of the physical space, availability focuses on time. The goal is to minimize the time needed to move from a decision to a result. The availability of solutions is crucial. On the product level, empowerment speaks for simplicity in design. Products should be understandable and democratized.